EASES CRIB TO BED TRANSITION: The DockATot Grand helps ease the transition from crib to toddler or big kid bed. The built-in, air-permeable bumpers act as bed rails, and give little ones a snug sense of security in their newer, bigger beds. Its unique design also allows parents to safely co sleep with their kids. REDUCES STARTLE REFLEX: The startle or “moro” reflex is a natural reflex for babies between birth and 6 months. The startle reflex may only last a few seconds, but some babies can startle themselves awake during sleep. DockATot can help prevent the infants from waking up when they have the startle reflex due to the unique shape, positioning of the sides and the cushioning effect of the dock. Introducing our multitasking stage 2 dock for babies age 9 – 36 months. The Grand is perfect for cuddling, playing, lounging, resting and everything in between. It's ideal for travel-either from room to room, grandma's house or on vacation. It's also ideal for bed transitioning, thanks to built-in, air permeable bumpers that act as bed rails, allowing young children to settle more easily in a bigger bed. DockATot docks give little ones a snug sense of security in their newer, bigger beds. All materials used are breathable, washable and hypoallergenic. All filling materials are sourced from world-leading suppliers and offer hygienic and non-toxic properties. REDUCES RISK OF FLAT-HEAD SYNDROME: Positional plagiocephaly (aka Flathead Syndrome) is a result of a baby lying on one side of the head more than the other. The mattress on each DockATot is a soft thermobonded fiber wadding plate with a great bearing capacity to relieve pressure on the head. In addition, the fibers of the surrounding bumpers on each dock gives great support and can function as a positioning prop, enabling you to alternate the baby's resting position, from back to either side. 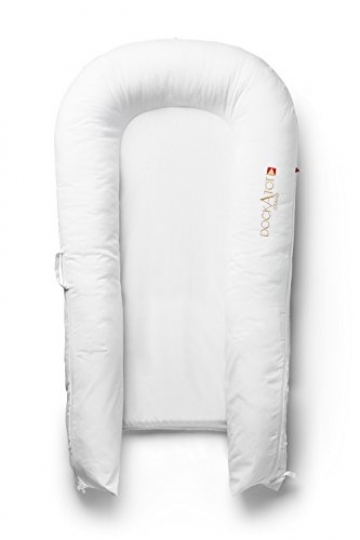 BREATHEABLE, WASHABLE AND HYPOALLERGENIC A PERFECT MICROCLIMATE: DockATot is hypoallergenic and made with the most nurturing and hygienic fabrics that also have excellent air-permeability.